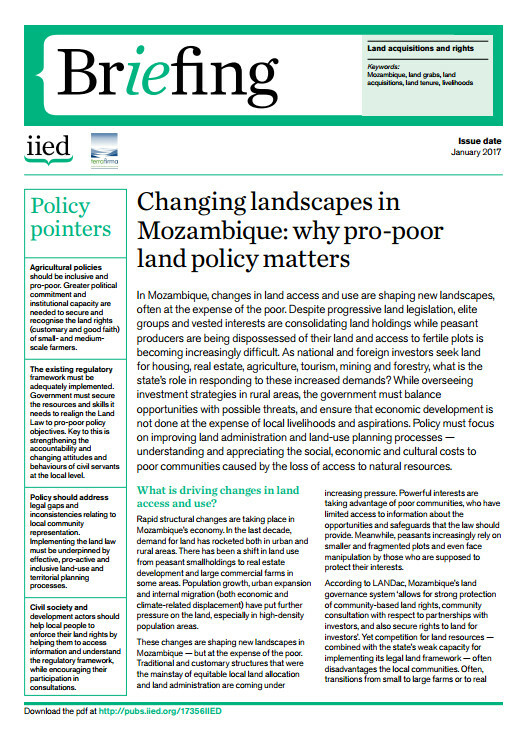 In Mozambique, changes in land access and use are shaping new landscapes, often at the expense of the poor. Despite progressive land legislation, elite groups and vested interests are consolidating land holdings while peasant producers are being dispossessed of their land and access to fertile plots is becoming increasingly difficult. As national and foreign investors seek land for housing, real estate, agriculture, tourism, mining and forestry, what is the state’s role in responding to these increased demands? While overseeing investment strategies in rural areas, the government must balance opportunities with possible threats, and ensure that economic development is not done at the expense of local livelihoods and aspirations. Policy must focus on improving land administration and land-use planning processes — understanding and appreciating the social, economic and cultural costs to poor communities caused by the loss of access to natural resources. In Ghana 70 per cent of the population are smallholder farmers who depend on the land for their basic needs. Growing competition for this resource is having significant impacts on rural livelihoods and land governance. Senegal currently has a complex and poorly regulated system of land governance, which — combined with an urbanisation trend and increasing outsider interest — is leading to land privatisation and a consequent reduction in the availability of cultivable land for small producers. The ways in which people obtain land in Uganda are changing fast. Land that used to be secured through inheritance, gifts or proof of long-term occupancy is now more commonly changing hands in the market. The Testing REDD+ in the Beira Landscape Corridor of Mozambique initiative closed in December.